Our top pick for the best probiotics supplement is the Dr. Mercola Complete Probiotics 60. This product provides 10 bacterial strains that serve as good bacteria for your gut. It eliminates irregularities such as bloating, constipation, and other abdominal distress. All-in-all it’s a complete probiotics formula for supporting digestive health. Our step up pick is the Renew Life Ultimate Flora Probiotic with impressive health benefits. It restores healthy bacteria in the digestive and immune system, making it one of the best probiotics supplements on the market. This product features vegetable capsules with strains of Bifidobacterium and Lactobacillus. It is our pick for the best probiotics, with a scientifically-proven formula to boost immune health for adults. The best budget pick is the TruBiotics Daily Probiotic Supplement contains no traces of harmful and toxic fillers or binders. It’s one of the best probiotics supplements because it also contains high amounts of living cultures compared to other probiotic supplements. This product does its job well to improve your immune system and maintain healthy digestive balance. It comes with a combination blend of two strains: Bifidobacterium animalis and Lactobacillus acidophilus. Before you choosing the best probiotic supplement for yourself, you need to know more about what probiotics are and their health benefits. Probiotics are scientifically-engineered formulas, commonly referred to as the “good bacteria.” They line up in your digestive tract to promote nutrient absorption as well as fight immune infections affecting the gut. Probiotics supplements work effectively in people with preexisting gastrointestinal conditions such as intestinal disorders. It introduces good bacteria into an environment that’s already deprived of healthy bacteria. An imbalance of good bacteria against bad bacteria can lead to a number of gastrointestinal conditions. So for the most part, introducing best probiotic supplements to reap its benefits against such disorders is beneficial. Historically, these dietary pills were used in the form of yoghurt since ancient times. This was before the availability of probiotic microorganisms and fermented products. With that said, you can consider buying best probiotics supplements for both nutritional and therapeutic purposes, but only with proper awareness on the subject. In choosing what’s best for you, these are the following factors we took into consideration. And more importantly, this is what you should know. Bacterial strains: When choosing the best supplements, the first thing to look at is the different types of strains present. When considering bacterial strains, do not give important to the total number of bacteria in a probiotic. Instead, what’s more important is the number of different strains of bacteria a probiotic supplement contains. The different strains present in each brand possess different functions in the digestive tract. That said, if a probiotic supplement contains many strains, it’s considered to be more effective than a product featuring only 1-2 bacterial strains. As it happens, bacterial strains work in combination to regulate a healthier digestive and immune response. If you want to use a probiotic to address specific health concerns, it’s vital to know about the follow bacterial strains that’s right for your condition. These are primary probiotic agents or species. Most gastroenterologists recommend probiotics with Lactobacillus species. In fact, the best dose should contain this bacterial species before anything else. These strains present in the best probiotics supplements have far-reaching effects in the gut such as. Another common strain present is Bifidobacterium longum. Like L. Acidphilus, this probiotic strain helps regulate a healthier gastrointestinal response in adults. It helps the good bacteria in crowding out toxins in the gut. In the evaluation of Bifidobacterium, it was concluded that it helps reduce intestinal disease and strengthens immune response in piglets. This study was conducted on piglets with gastroenteritis which is a common bacterial infection associated with gastrointestinal function. This is a common probiotic strain necessary for defeating Helicobacter pylori, which is one of the leading causes of duodenal ulcers and gastritis. Both these conditions are bacterial infections arising in the gastrointestinal tract. Helicobacter pylori affects the lining of the gut and the immune system. Packaging and Delivery: Having the right packaging is important so that the probiotic supplement can last for a long time. More importantly, being aware of the different packaging and delivery methods of each manufacturer helps you make a better decision. The delivery system of a best probiotic supplement refers to the way the manufacturer shelves and delivers the bacteria. Bacterial species, unlike other nutritional supplements, need to remain both active as well as healthy. If they’re not effective, they lose their ability to read all corners of your gut to crowd harmful bacteria. It is also likely that the bacteria inside a probiotic supplement get destroyed due to inaccurate and inefficient delivery. Due to awareness of such technology, manufacturers are now adopting new and efficient way to pack and deliver best probiotics supplements. The most recent innovation in packaging and delivery is the “beadlet” technology. The “beadlet” technology uses capsule formulation to protect bacteria strains from remaining ineffective as soon as it mixes with the stomach acid. It keeps the bacterial species of a probiotic alive. The only way to weed out the the best supplements is to look for brands who disclose how their products are made and with what materials are they packaged and marketed. This is the true mark of a reliable and honest manufacturer. Expiry information: Another important marker of a good product and product quality is expiration dates. Most probiotics supplements products do not adhere expiration dates. But opt for a brand that discloses information regarding the same. An expiration date on a supplement tells you how active and healthy the bacteria will be. In addition to this, it also tells you at what prescribed levels and for how long the bacteria will remain potent. This information should be backed by standard testing as well as formulation data. This means the brand pays attention the kind of information that matters to its consumers. Do not risk your money on a bottle that comes with “product guarantee” stamps or any such claims. If the retailer offers minimal or falsified potency of its bacteria, look for further expiration date information by contacting its customer support. CFU Count: A probiotic brand with a higher CFU count features a higher amount of probiotic supplements with healthy and potent probiotic bacteria and strains. On an average, from 5 to 100 billion probiotics. CFU stands for Colony Forming Units which quantifies the number of bacteria present in a probiotic. These bacterial species, as the name suggests, form colonies to crowd harmful bacteria. You can’t miss the Dr. Mercola Complete Probiotics 60, which has a count of 70 billion CFU. This product features a non-dairy and wheat, gluten, and free formula. Which lasts up to 18 months when stored at room temperature. Each bottle contains 60 capsules which is a good deal if you travel a lot. It is packaged and delivered in a glass bottle which keeps each probiotic pill alive and effective. Each pill is processed with nitrogen seal and frozen dry to ensure 100% potency. The bottom line is that these best probiotics supplements are surprisingly effective as they boast of 35 billion each capsule cell count. The primary concern about this product is that the cells come with a guarantee at the time of its manufacture. They’re also not suitable for children, so it’s a good probiotic recommended for adults above 18 years of age. 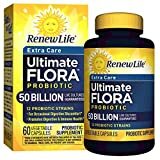 The Renew Life Ultimate Flora Probiotic does everything a probiotic should do. It adds more good bacteria in your intestinal tract for nourishing. Each probiotic capsule is vegetable-based and contains 10 bacterial strains including Bifidobacterium and Lactobacillus. These strains relieve digestive discomfort, bloating, and gassiness. Regular consumption of this probiotic for overall immune and digestive support will save you a trip to the doctor. I highly recommend this best probiotics supplements for everyday use for better digestion. The TruBiotics Daily Probiotic Supplement is an affordable and reputable product. They take at least a week to have a full effect on gastrointestinal health. It helps cure bloating, stomach pain, gas, and irregular bowel movements. The higher percentage of live cultures present in this probiotic strengthen the immune system while balancing gut flora. The capsules are protected with a strong plastic seal. This keeps the environment away from the cell count in each probiotic capsule. The Garden of Life Women Probiotics is a good dose for women who want to boost their immunity and digestion. 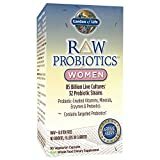 This is an everyday probiotic for women with 32 bacterial strains and 85 billion CFU count. It contains Lactobacillus acidophilus, Bifidobacteria, vitamins, and minerals. It’s your ideal vegetarian enzyme supplement that’s gluten-, soy-, and filler-free. What I liked the most about them is that it is ideal for anyone with allergies. The Garden of Life Men Probiotic is specialist probiotic-created enzyme for better gut and immune health. 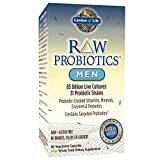 Just as how our previous pick is specifically-formulated for women, this probiotic is for men. It contains 85 billion live cultures, 31 bacterial strains, and a combination of vitamins, minerals, and prebiotics for boosting immunity. 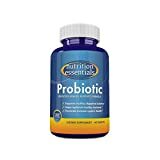 What I liked the most about these best probiotics supplements is that it supports prostrate health by boosting nutrient absorption in the body. The Culturelle Daily Kids Probiotics Formula supports gut development and nourishment in children. This is vital your child needs a good balance of gut flora to keep harmful bacteria at bay. Children are also sensitive to other food products such as dairy, lactose, soy, and gluten. None of which are present in this probiotic. It is one of the best probiotics supplements for supporting child development. What I liked about this product is that it contains lactobacillus GG (rhamnosus) which is necessary for the prevention of gastrointestinal disease in infants. 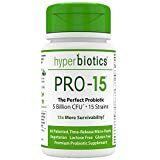 You won’t find probiotics quite like the Hyperbiotics PRO-15. They’re backed by their super-efficient and naturally-derived technology. These supplements contain 5 billion cell count per capsule, which amounts to up to 75 billion CFU. With micro-packed ingredients, they half the size of standard capsules, which means they’re easy to swallow. And they contain over 15 targeted bacterial strains including Lactobacillus, Streptococcus, and Bifidobacterium among others. What I liked the most about them is that each capsule is bio-tract coated which means it delivers a higher percentage of good bacteria as soon as it passes through the stomach acid and into your intestinal tract. The Nutrition Essentials 60-Day Probiotic has all the qualities of a healthy probiotic that you will love. You will notice a difference in your digestion in just 2 days! Consider these probiotic supplements for everyday usage, better digestion, immune health, and less abdominal distress. Its main focus is to accelerate vitamin production in the gut. Specifically, vitamin B12 and vitamin K2 regulation. With 15 cells per capsule, its primary probiotic strain is Bacillus Coagulans. The feature I loved the most is that this best probiotics supplements requires no refrigerator for safekeeping. 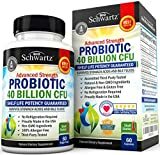 The BioSchwartz 40-Billion CFU Probiotic is shelf-stable and prebiotic-formulated supplement. The chances of good bacteria reaching your intestines when the CFU is higher than traditional levels are high too. This is what makes this probiotic one of the best probiotics that’s 20 times more effective. It is specifically formulated to manage acid reflux, bloating, stomach acid, and bile fluids formation. The 40 billion CFU count ensures the good bacteria reaches your intestines to eliminate toxins. The feature I loved the most is the maximum bacterial potency right up to the expiration date. 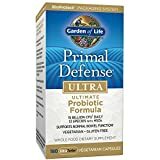 The Garden of Life Primal Defense Probiotic holds the key not just for a stronger digestive system, but is essential for complete immune defense. It contains 5 billion CFU per capsule with the goodness of HSO, which thrives even in the toughest of digestive environments. If you have extreme food sensitivities, this probiotic will do. It contains Lactobacillus acidophilus, Bifidobacteria, S. boulardii, and subtilis. The feature I loved the most is that it’s gluten-free and requires no refrigeration for its long-lived potency. Nothing beats the ingredients and product quality of these 10 best probiotics supplements. Others were excluded from this list due to lack of reliable manufacturer information. Generally, probiotic brands test their products for their CFU count, bacterial strains, and packaging and delivery. However, many other probiotic brands did not claim any one of the mentioned examinations in their formulation. A. Probiotics contain over 2-7 billion good bacterial species, per capsule, which are necessary for boosting gut health. It also works as an immune booster as 80% of your immune system is located in your gastrointestinal system. That said, the gastrointestinal system is the first route of contact with the external environment, as it comes in contact with nutrients, bacteria, and other substances. Your gut contains a good balance of good and harmful bacteria. Due to constant exposure to external stimulus such as viruses, toxic substances, fungi, and protozoa, good bacteria is often depleted much faster than bad bacteria. The good bacteria present in probiotics restricts the growth of such harmful species in the tissues of the colon, gut lining, and the intestines. It also helps in nutrient absorption and strengthens the immune system against infections and diseases that occur due to increased inflammation. Another simple way to understand how they work is with an understanding of the intestinal microbiome or commensal microbiota present in the gastrointestinal system. While our gut contains over 500 bacterial species, they are responsible for the production of vitamin K, B vitamins, folate, and short chain fatty acids. Q. How do I ensure that they will work well for my health? A. The common ingredients in a probiotic are Lactobacillus and Bifidobacterium species. Historically, the first ever probiotics supplements were non-pathogenic in nature. And ever since, live cultures present in them mimic the functions of commensal gut bacteria or microbiotia for aiding digestion and gut health. They have a direct impact on 4 mechanisms associated with the gut. It inhibits potential disease-causing pathogens, improves the gut’s barrier function, boosts neurotransmitters and regulates proper immunomodulation, and releases a host of bacterial species or microbiota to promote a healthy gut to brain pathway. Q. What kind of foods and supplements destroy good bacteria in the gut? A. Adults and children need the best probiotics supplements to keep up a healthy gut flora balance. However, certain kinds of foods such as diary, non-organic meat, sugar, or GMO-foods and antibiotic supplements deplete the concentration of good bacteria in the digestive tract. This can, over time, lead into an inflammatory and infectious digestive environment. Such food and antibiotic residues in the gut kill off good bacterial strains that your gut produces with the help of good bacterial species. These include vitamins, short chain fatty acids, and folate. These turn your digestive system into a breeding ground of yeast infections and other viruses, parasites, and fungi. So, you most definitely need need healthy doses to restore the natural gut flora balance in your body. Q. How long can I take a probiotic? A. They are cogent microorganisms which survive in the digestive system by dividing and colonizing the microbes present in the gut. The best way detect the presence of a probiotic is by inspecting the stool during the duration of its consumptions. Most people often notice a slight difference in stool consistency and bowel movements during periods of probiotic consumption. But if you’re unaware of which probiotic to take for your consumption, it may be that the bacterial strains do not impact the gut microbe in a similar way. For some people, it takes about 1-2 weeks for a probiotic to become effective and potent. They are engineered in such a way that they alter the bacterial composition of your stool. In some cases, it also alters your body’s gene expression associated with carbohydrate metabolism and absorption in the body. This has an impact on your gut microbes. If such changes in your stool and bowel movements are consistent followed by an improvement in digestion and immune responses, continued prescription of a probiotic is necessary. Q. Can they aid weight loss? A. There is strong evidence that links a healthy gut flora with weight loss. To better explain this association, let me give you an example. All these studies prove that bacterial strains present in probiotics decrease fat absorption and burn fats in the body. Q. Are they good for cardiovascular health? It keeps cholesterol levels in check to prevent hypertension. Increased levels of low-density lipoprotein cholesterol is a primary cause of hypertension and hyperlipidaemia in humans. The accumulation of this and other inflammatory substances can cause atherosclerotic plaque buildup in the blood vessels and arteries. Q. Is it possible to consume probiotic-rich foods instead of supplements? A. Before the introduction of probiotic supplements, fermented milk products were consumed by most people for its probiotic-rich health benefits. And it wasn’t until the 20th century that it was discovered that fermented milk products such as yogurt contains high bacterial strains for healthy gut flora. Now, after decades of research and evaluation of probiotics, some common examples of probiotic-rich foods are yogurt, Kefir, sauerkraut, kimchi, brine pickles, olives, and more. Each kind of food contains a group of bacterial strains to aid digestion, support immunity, and prevent digestive issues such as diarrhea, IBS, constipation, etc. It’s important to consider buying only non-pasteurized foods. That said, here is a simple run-down of the different probiotic-rich foods and their bacterial strains. Getting your daily dose from either different types of foods or pills is equally effective. The main focus should be to consume the maximum number of bacterial strains to support digestion and immune health. Probiotic supplements contain higher bacterial strains than probiotic-rich foods, so they may prove to be more effective than foods depending upon your health condition. Q. What’s the difference between prebiotics and probiotics? A. Probiotics and prebiotics share only a common health effect and that is they’re both good for boosting healthy bacterial growth in the gastrointestinal system. But they’re not the same. The former are composed of live cultures that are alive and potent. They mimic the functions of the intestinal microbiota that are present in high amounts in the gut. To put into simple words, prebiotics are digestible foods for probiotics that help maintain a healthy digestive system. Q. Can I take probiotics and antibiotics at the same time? A. There’s much discussion on the consumption of probiotics and antibiotics at the same time. Most gastroenterologists prescribe best probiotics supplements to fight the side-effects of an antibiotics. This is an effective treatment for the prevention of antibiotic-induced diarrhea. Based on the analysis of many randomized controlled trials, it is concluded that taking both dietary supplements, at the same time, is effective and safe for humans. In other news, candida albicans is another pathogen that leaves your body defenseless and exposed to yeast infections. This pathogen targets the functioning of your small intestines causing serious digestive imbalance and inflammation. You should take each supplement two hours apart for maximum efficacy. That said, taking your probiotic during your meal or half an hour prior to the meal is the most effective time. So plan for schedule accordingly. Q. What’s the best way to store them? A. Because they contain living bacteria or “live cultures,” they need to be handled and stored with care. The potency of the live cultures present in a probiotic depends upon how you store them. This includes lower or higher temperatures and low or high humidity levels. Some require refrigeration when stored at home. That’s why the live cultures maintain their full potency after consumption. If a probiotic is refrigerated during manufacturing, you will be able to read its storage instruction at the label. Such brands usually recommend you refrigerate the supplements. This is because they are sensitive to sunlight, moisture, and heat. The heat is more likely to destroy the living cultures inside probiotics supplements. Unless you’re buying a freeze-dried probiotic, you need to refrigerate all kinds of probiotics to keep humidity at bay. 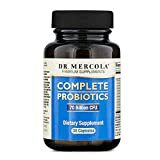 While there are many reliable brands such as Renew Life, Garden of Life, and TruBiotics, the top competing and best probiotics supplements is the Dr. Mercola Complete Probiotics 60. If you want something reliable, potent, and effective to help with digestion and immunity, this supplement is vital. As we said earlier, majority of supplements come with live cultures and multiple bacterial strains. But not all of them are worth investing in. When reading a brand label, make sure you check for the product’s CFU count, manufacturing and packaging details, and expiration date. The survivability of best probiotics supplements depends their bacterial strain count. Look for bacterial strains such as Lactobacillus acidophilus, Bifidobacterium, Lactobacillus rhamnosus, and Bacillus subtilis for better digestion. These reach your gut, unaffected and undestroyed by stomach acid to boost gut flora. As a consumer, the only question you are most likely to ask again and again is – Are they safe? There are many factors you need to consider when determining the efficacy of the best product. Make sure the bottle is fresher and has an active CFU count at the time of manufacture. Make sure that the capsules aren’t heat-treated as that kills of good bacteria, thus depleting its shelf life. Some brands promise 1 trillion CFU count per bottle. You might think the higher the CFU count the better, right? But in this case, that isn’t so. Look for brands with a CFU count in less than 80 billion per bottle. This, according to Food Standards Codes, is necessary for optimal health and well-being.